To continue with the journey to boost skill development in Karnataka, ApnaDesh, an NGO in association with National Skill Development Corporation (NSDC) brought ‘Skill on Wheels’ to Bangalore after their successful launch in Mysore. 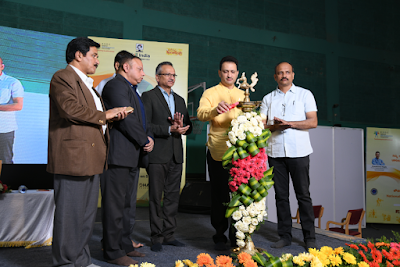 The occasion was organized at BMS College of Engineering Auditorium and was attended by Anantkumar Hegde, Minister of State, Ministry of Skill Development & Entrepreneurship; Ravi Subramanya, MLA, Basavanagudi; and B.N. Vijay Kumar, MLA, Jayanagar. NSDC, in association with RiiiT, GSS and Dhatri foundations has come out with the innovative concept of ‘Skill on Wheels’ to reach out to the youth residing in rural India. It aims to bridge the gap between the mentors and last mile candidates by spreading awareness about importance of skill development as a medium for life transformation. The main object is to reach the principle part of potential job seekers who are at a distance and are inaccessible. The aim is to cover 500+ Institutions with approximately 3, 00,000+ job seekers.